When Disgaea: Hour of Darkness debuted, I became attached to Laharl and company. After all, they introduced me to prinnies and taught me how to correctly spell “dood.” Years later, Nippon Ichi has returned to this adored cast with D2: A Brighter Darkness, picking up right after Laharl finally becomes Overlord. Unfortunately, the developer didn’t make Laharl, Etna, and Flonne as intriguing this time around. A Brighter Darkness still features grid-based gameplay, but newcomers beware – this is a more punishing entry. As an experienced Disgaea player, I found myself leveling up my party in early stages, something I’ve never been forced to do before. However, the maps are some of the most creative yet, like an entire episode set at a rock concert. The only drawback to maps is that sometimes they rely too heavily on Geo Panels, colored portions of the map that give bonuses or penalties. Destroying Geo Blocks still can alter your fate in combat, provided you figure out which panels to go after for damaging opponents and nullifying the block’s effects. While exploiting Geo Blocks is fun, it loses its lure after a while, making you want something new to strategize. A Brighter Darkness keeps your mind focused, whether you’re maximizing damage or pairing compatible characters to increase the odds of a combo attack. You also weigh special abilities of your created characters, since you select a perk for each one. For instance, thieves can ensure that treasure chests always give a level three or higher item. Enemies also have perks, like increased poison odds, to take into consideration. The new customization choices were by far my favorite, as I felt like I had more control in building my characters. The choices for perks also gave me plenty to consider, since all were appealing. Ultimately, it forces you to really pick what type of tactics you want to employ this time around. The addition of mounts is new to the entry, allowing for high-powered attacks and increased movement. I experimented with different mounts, but the risks outweigh the reward. Not only do characters share health, but it means one supercharged turn instead of two individual ones, so fewer combination attacks are available. As only a limited number of characters can be on the battlefield at once, this digs into your pool rather quickly. The only time I found mounts useful was to give the annoyingly slow mages some extra footing, but it felt like a waste to use them on any other class. The item world, where you choose a weapon to level up along with your characters, also has some small tweaks. While you’re going through the randomly-generated levels, pirates have the ability to invade and steal treasure. Pirates are tougher than your average opponent, giving you reason to keep your guard up. They add some much needed unpredictability to the humdrum grind of the item world, but don’t drastically alter the experience. Plenty has changed since the franchise’s inception, but everything is pared down here. If you’re expecting the ambition of Disgaea 4’s superb online features, like user-generated content, look elsewhere. The script is also weaker, from poor pacing to flat parodies. The comedy doesn’t really kick in until the fourth chapter, and even a new character like Laharl’s mysterious sister can’t save it. Although, Etna does bring much needed gusto with her chapter previews. But for my favorite cast's return, I expected better; something that made the wait worth it. A Brighter Darkness is more than passable, but it’s not my favorite. 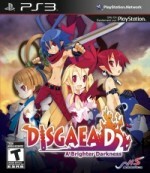 Compared to Disgaea 4’s ambition and heart, it is a letdown. Disgaea 4 took the series to new places, opening up multiplayer and community, but A Brighter Darkness doesn’t do anything as impressive. This is even more disappointing if you are a fan anticipating a reunion with beloved characters. Laharl, Etna, and Flonne are back, but are they as cool as before?